Cathedral Brand longer burning, guaranteed and stamped 51% Beeswax candles feature a dimensional design and are expertly crafted for table altars. Insistence on the finest beeswax is long-standing because the wax is symbolic of the purity of Christ Himself. 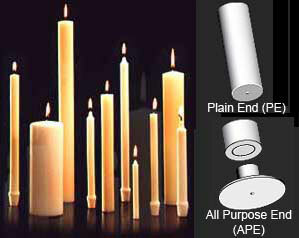 All-purpose End (APE). Candle shipping charges based on weight and may differ from price quoted on web order.